Some of the hardest-working boats in the country are surely the water taxis that service the Abel Tasman National Park in Nelson. These boats operate seven days a week, up to 10 hours a day. Almost every stop requires the boat to be backed up on to the beach, with the anchor winch used to pull the boat off again. This punishing schedule places enormous stress on hulls, engines and winches. Each boat may perform over 30 'landings' per day through what is sometimes fairly rough surf, and can have half a dozen kayaks loaded or unloaded at each point. Aluminium is the only material that could seriously withstand this routine; hence, all the commercial boats are alloy hulls. The engines similarly take a beating as they are run up onto the beach. The coarse sand quickly removes all the paint from the lower unit, and water pumps need to be able to resist ingesting sand. Standard equipment is a hydrofoil (fitted to boost power when the engine is running half-tilted out the water). One striking fact will be apparent to even the most non-boat-savvy visitor – the boats used by most of the operators are identical. Practically the entire fleet has migrated over to the Osprey 750, and most are powered by high-efficiency Honda 225hp V-Tec engines. The prevalence of this boat model is a reflection of the quality and reliability of the hull, built by Nelson's Alloyd Engineering. Discussions with various skippers reveal they love the stability of the hull, the ease with which it runs up on the beach and even more importantly, how easily it comes off again. Since the first Osprey was bought by Aqua Taxis in 1996, as vessels have come up for replacement they have almost universally been replaced with Ospreys. 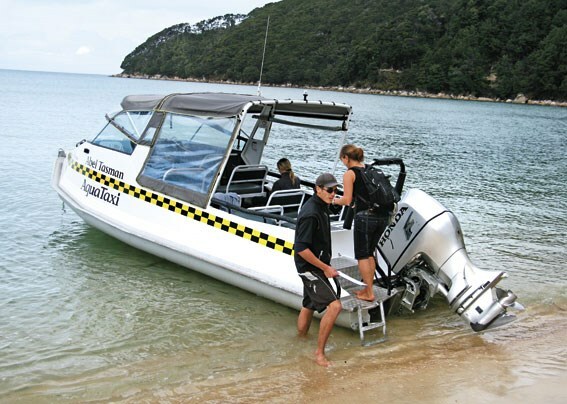 Lloyd Elliott, owner and managing director of Alloyd Engineering, says there are now almost 25 Osprey boats in use by five different taxi operators in the Abel Tasman region. The boats are also favoured by water taxis and other commercial operators in other areas, both in the South and North Islands. Elliott says a fair number of operators have even purchased Osprey's for their own personal use, further evidence of their satisfaction with the vessels. 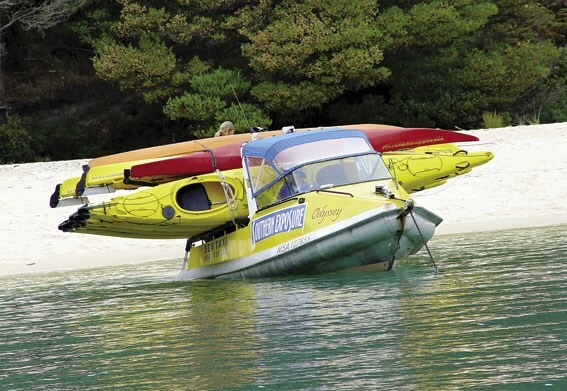 Aqua Taxis, for example, has bought 12 more Ospreys since the first one almost 12 years ago. Matt Atkins, Operations Manager of Aqua Taxis, says they have standardised on the Ospreys because they are a great sea boat and are very user-friendly. "They have the additional benefit of being locally made, so we can have input into the design and incorporate changes to suit specific requirements." The boats in use at Abel Tasman are all semi-standard Osprey 750s, in either the hard top or cuddy cabin version. Seating is laid out with double seats either side of a central walkway, to provide a capacity of 18 passengers plus the driver. A sunroof and clears are provided for the passenger's protection from the elements, while on some models a sturdy frame is fitted to each gunwale to allow kayaks to be loaded across the stern. The boats have a surprisingly high 23-degree deadrise at the transom, giving a soft ride through what are sometimes adverse sea conditions. Despite their bottom being far from flat, they are still easy to beach. The hull is built of 5mm plate, while the sealed pontoons give the stability and unsinkable reliability required of a commercial boat. Because every Osprey is built to survey standards, no additional changes are needed for MNZ (formerly MSA) certification. Although Osprey does not dictate which engine should be installed, the Honda V-Tec has gained general acceptance for reliability, fuel-efficiency and low emissions. Most of the boats have these power plants, which may run up 300 hours usage per month. This is more than the average recreational boatie uses in three years. Standardising on the same model means that servicing and maintenance is simplified for the operators, and the bottom line is lower running costs and less down time. Atkins says that Aqua Taxis also runs a smaller number of its boats with Suzuki engines, primarily the DF300 model. For longer trips they wanted a bit more power than they could get from the top-of-the-range Honda, and have found the Suzuki suited their requirements perfectly. Another critical component for these boats is ground tackle. Since each vessel may run several circular trips, they may deploy and retrieve their anchor nearly 30 times per day. Generally the anchor is dropped as the boat backs up onto the beach. Once the passengers and gear are loaded the anchor is used to drag the boat off the sand, so a serious amount of winch power is needed. Reliability is also important as a failed winch would leave the boat stranded until the tide came in. The winches are Muir Atlantic VR1250s, coupled with 15kg Spade anchors. The substrate of all the bays is sand and fine gravel and the anchors provide maximum grip in this bottom. The Muir winches have a 1000-watt motor providing over half a tonne of 'pull', and have proved to be exceptionally reliable. Most boats also have a winch control at the stern so the skipper can slowly pull the boat off the beach as they load passengers. Of course, boats also need to get in and out the water, and once again there are "special needs". The launch ramp at Marahau, the gateway to the Abel Tasman National Park, only has water for a few hours either side of high tide. Shifting sand banks mean that tractors are used for beach-launches the rest of the time, and seriously over-engineered alloy trailers are used. Due to the lack of a wharf, passengers climb on board while the boat is on the trailer on dry land: the tractor launches the "complete package" into the water. At the extremes of tide this can require an almost 500m drive over the shallows to find sufficient water depth for the boats to float. Elliott says that the factory is currently building a pair of Osprey 800s for use by an Akaroa-based operator who operates a dolphin swimming experience. In addition to the standard seating these will require a wet area for the swimmers to tog up, as well as an efficient boarding platform. Hence the extra length of the 800 was selected in preference to the 750 model. Although the boats will not need to pull up on a beach every day, they will be just as hard-working.